Originally, I was going to try and pinch off a comic about Harold and Kumar Escape from Guantanamo Bay, but I couldn’t muster up the enthusiasm for it. It wasn’t until a friend e-mailed me the other day asking if I was excited for Iron Man a week from today that I decided to throw caution to the wind and kick off my Iron Man arc a little early. Incidentally, I didn’t notice that my cardboard Iron Man looked anything like a MiniMate until I finished coloring it. At any rate, the plan was to do a week of Iron Man comics starting next Monday. I’m so ridiculously excited for this movie, it’s offensive. It’s literally suffocating all of my relationships. People are BEGGING me to stop talking about it. So why not extend that into the digital realm as well. Fans might remember that Tom owned a much more convincing Iron Man costume around Halloween 2006 and could possibly be wondering what happened to it. Don’t worry. An explaination is forthcoming. You’ll just have to check out the site next week! Another reader sent me something a little more obscure when he delivered this link to an AWESOME poster designed designed by Jesse Phillips for a special advanced screening of Iron Man April 28 at the Alamo Drafthouse Cinema Lamar in Austin, Texas. The poster is 24 x 36 and printed with glow-in-the-dark ink! They’re only selling 100 and what I wouldn’t do to get my hands on one of them! I don’t know that Cami would be particularly understanding about the purchase, though. She puts up with a lot regarding my Iron Man obsession. I think this would be crossing the line. Something a little closer to my price range are the new Iron Man toys being sold with Burger King kids meals. The same friend that wrote me asking if I was excited to see the movie was the one who gave me the head’s up on this. Yeah… guess where I went for lunch today? Sadly, it looks like I’ll be eating at Burger King almost exclusively until I collect the rest of the figures or the promotion is over. Even though I have access to the Burger King promotion, I’m not completely happy. Have you guys heard about the Iron Man promotion they have going on over at 7-11? YOU CAN DRINK A SLURPEE OUT OF IRON MAN’S EMPTY HEAD! At any rate, I’m dispirited because I can’t get those cool collectors cups. I was similarly cheesed when they had that awesome promotion for The Simpsons Movie last year and they converted a bunch of 7-11’s into Kwik-E-Marts. I was lucky enough to meet a fan at a convention who traveled to one and brought me back a couple cans of Buzz Cola. That was really cool. Is there anyone out there with access to a 7-11 willing to send me some of these collector cups? Man, that would be wild! E-mail me and we can iron (HA!) out the details. PUN INTENDED! Do you guys understand how important Iron Man is to me? Do you? If not, I will soon have photographic evidence for you to pour over next week that will actually align quite nicely with the crux of the storyline I’ve prepared. So stay tuned for that! It’s completely possible that I’m setting myself up for the most monumental disappointment ever. I’m pinning a lot of my hopes and dreams of the quality of this movie and, frankly, if it turns out as badly as Spider-Man 3 did, I’m not sure I’ll ever recover. But this movie is something I’ve dreamed about since I was a kid. More so than Spider-Man or the Hulk or any of my other heroes. I feel like I’ve been waiting for this movie my whole life. Stay tuned next week for more Iron Man inspired insanity! Have a great weekend, everyone! IT'S NEVER BEEN SO CLEAR. 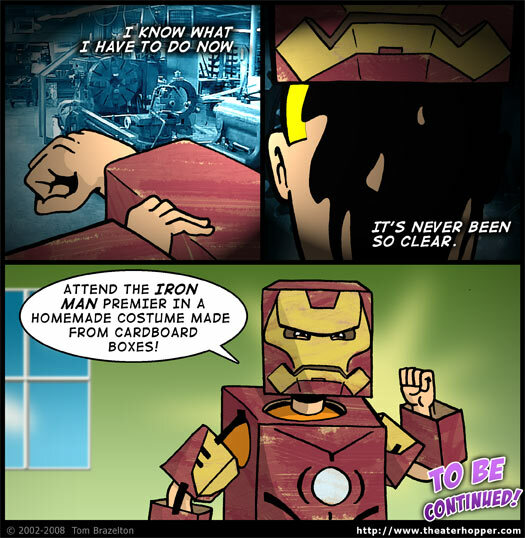 ATTEND THE IRON MAN PREMIER IN A HOMEMADE COSTUME MADE FROM CARDBOARD BOXES!